What is discounting in a letter of credit transaction? How to discount a letter of credit? What Types of Letters of Credit Are Available to Discounting? Letter of credit is not a cheque, but rather it is a conditional payment undertaking of the issuing bank. As a result a beneficiary first of all needs to fulfill his obligations under a letter of credit, before considering himself to be eligible of the issuing bank’s payment. The beneficiary can fulfill his obligations under a letter of credit by making a complying presentation. to accept a bill of exchange (“draft”) drawn by the beneficiary and pay at maturity if the credit is available by acceptance. Most of the exporters think that they could discount a letter of credit as soon as they have received it from their banks. This belief is not correct at all. The beneficiary needs to make a complying presentation in order to receive any form of payment under the letter of credit. No complying presentation means no payment under the letters of credit. What Types of Letters of Credit Are Available to Discounting? Letter of credit discounting is related to the letters of credit which are available with deferred payment, acceptance or negotiation. At sight letters of credit should not require any discount mechanism as issuing banks or confirming banks must honor at sight credits as soon as they determine that beneficiary’s presentation is complying. In trade finance the letter of credit discounting and letter of credit negotiation used used in the same manner. However they could have different meanings in regards to banking practice and commercial law. 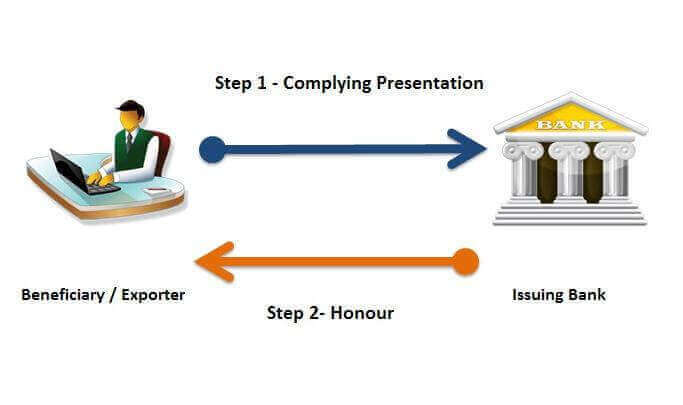 Negotiation is defined under UCP 600 as follows: Negotiation means the purchase by the nominated bank of drafts (drawn on a bank other than the nominated bank) and/or documents under a complying presentation, by advancing or agreeing to advance funds to the beneficiary on or before the banking day on which reimbursement is due to the nominated bank. Nominated banks discount the letters of credit with recourse basis. This mechanism defined as negotiation. Confirming banks discount the letters of credit without recourse basis. This mechanism defined as forfaiting. Keep in mind that you cannot get any payment from banks unless you make a complying presentation under a letter of credit. If you would like to discount a letter of credit you should try to get discount approval from your bank before letter of credit is issued. You can get your bank’s discount approval and discount conditions by applying them with a draft letter of credit. Confirmed letters of credit can be discounted more easily than unconfirmed letters of credit. For this reason try to have the letter of credit confirmed by your bank to ease up the discounting process. Previous articleWhat Happens If a Letter of Credit Calls For a Wrong Incoterms? Next articleWhat does a non-documentary condition mean?